One of the most enjoyable parts of fatbiking for me is that I start to look for rides outside the norm of my typical single summer rides. I start to look at other possible rides that while not technical, have unique terrain or sights to see or aren’t possible in the summer. Elk Island National Park is only a 30 minute drive from Edmonton and offers terrain and wildlife that you’d never expect to see so close to town. There are tons of hiking trails within the park boundaries giving you a chance to experience wetlands and plains in terms of terrain and wildlife as small as field mice to the lumbering beasts that are woods and plains bison. The trails are double track with very little elevation gain which is why I haven’t ridden them in the summer, not to mention being busy with hikers. Winter, however, is a totally different story! Having ridden out here twice a couple of years ago I knew that the snow conditions would make or break the ride as one of my previous rides was breaking trail in nearly a foot of fresh snow ending up in some serious hike a bike. Given that we hadn’t received much snow in town I figured an early winter spin around the loop I had done previously would grant us perfect conditions. Our route was a 20km loop around Tawayik and Oster lake starting at the Tawayik Lake staging area. Here you’ll find a large parking lot, two outhouses, picnic tables, fire pits, and a shelter which I believe you can reserve for events. Next time I do the ride there will definitely be a fire and some drinks after the ride! Having been out here in the summer quite a few times on motorcycles and paddle boards and not having seen many Bison, if any at all, I was pleasantly surprised when we came into the first open plains area to be greeted by a large herd of them. Throughout the rest of the route we ended up seeing a few more herds scattered throughout the park. Do not corner the bison or try to push through their herd, they will charge and they are definitely faster than you regardless of their lack of Strava. The least amount of snow we saw. The Trek Farleys performed perfectly. As you can see in the above image, there are trail maps and markers throughout the whole park for the hiking trail network. If you’re not running a GPS unit these would be super handy as some of the trails have multiple ways to go, either to extend your loop or shorten it depending on how you’re feeling. 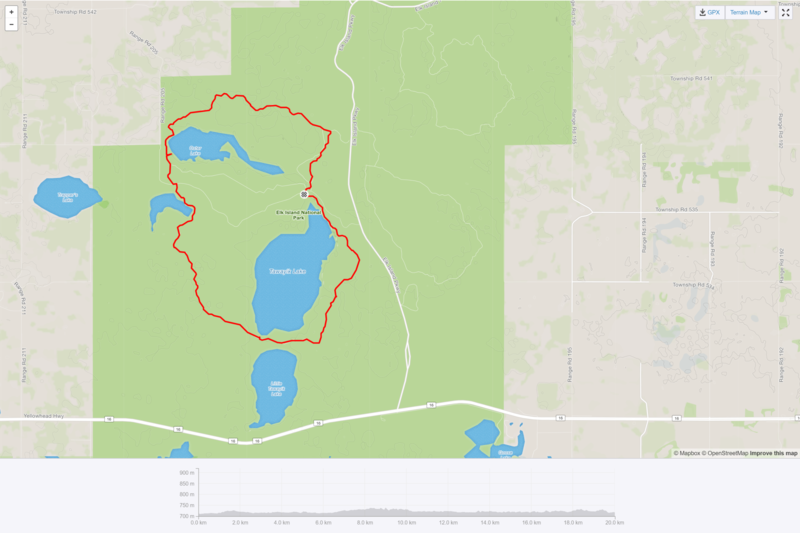 There is a back country campground midway through the loop that would make for a great first bike packing trip due to the short distance and proximity to the city. We had discussed winter bike packing out to here but it appears the campground part on this loop is closed during the winter. The ride took us an hour and forty five minutes at a casual pace with a couple stops for sip of water and photos. Due to the lack of traffic on the trails in the winter and the winds out there I would count on breaking trail no matter when you go as our tracks were filling in quickly due to the wind. If it has snowed a ton before you head out there be prepared for some serious work or just bring your snow shoes. Another factor to consider is the temperature, each time I’ve ridden out here the air is about 5 degrees cooler than in town and the windchill factor is always present. Once you’re out of the parking lot there are no outhouses and no places for water so keep that in mind. If you need to use the washroom, do it respectfully and off of the trails. You can see our route below and the Strava file for the ride, if you have any questions, feel free to ask below!